When it comes to keeping your pipes in good working order and preventing bursting pipes (and repair costs) due to cold weather, winterizing your home’s plumbing is the way to go. 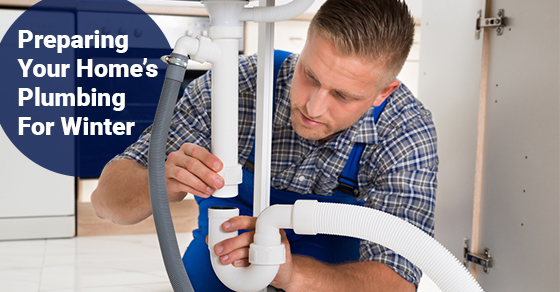 By this, we mean taking steps to protect your plumbing from the winter weather. Here are some tips. Insulating your pipes will help to prevent your pipes from freezing. Using heat tape or pipe insulation, wrap all exposed pipes in any unheated areas of your home. This is the most important thing to do when preparing your home’s plumbing for winter. Keep in mind that while pipes in garages or basements are particularly prone to freezing, it is still wise to protect pipes that are under any sinks or in closets. It is important to inspect your pipes and check for any possible leaks. This is particularly important during the winter months, when even a small amount of water could potentially freeze and burst your pipes. If you notice any signs of leaking, it is very important that you fix it right away. You may want to even consider having a professional check for leaks in places that are more difficult to get to, such as the attic. While you should call a professional for this task, it is a good idea to drain your water heater. Wherever you have exposed pipes in your home, such as the bathroom, kitchen or basement, open up your cupboards to allow warm air to insulate them and prevent them from freezing. Turn off any outdoor taps and faucets and drain any water from them. It is often a good idea to also turn off the water supply. Don’t forget to drain water from your hoses and then follow this up by storing it inside your home for the winter. During the winter months, ensure that your house is always warm. Even if you are going away on holidays during the winter, don’t turn your furnace off. If you are selling your home this winter or go south for the winter months, it is imperative to shut off your water. You should also consider draining your pipes, otherwise any remaining water could potentially freeze and then burst your pipes, leading to damage and expensive repairs.